If good things truly come in small packages, you and your grandkids should hit the road and head for a cruise port where you can embark on a cruise getaway on a smaller ship. Today's humongous ships offer dining, entertainment and activities menus that are dazzling, but sometimes, especially if you're a first-time cruiser, or if you don't like really big ships, less is more, and less is just as good as more. An example is Royal Caribbean International's Empress of the Seas, the oldest and probably smallest of the cruise line's fleet. The newest cruise ships weigh as much as 150,000 tons and carry as many as 4,000-5,000 passengers, but Empress of the Seas is only 48,000 tons and accommodates approximately 1,600 passengers and 668 crew. The ship had a refurbishing in 2016 and although it was built in 1989, it still looks good. With a ship that small, the question is: what makes it ideal for grandparents cruising with their grandkids? First, there's the Adventure Ocean Youth Program that caters to three age groups: babies to tots; kids age 3-11; teens age12-17. Program leaders have degrees in the field of education, and the Adventure Ocean's separate age-related spaces provide daytime and nighttime educational, recreational and just-plain-fun activities. While the kids are happily busy during a day at sea, you can take advantage of the spa's Thai Herbal Poultice Massage (poultices are heated and applied to the body at pressure points to relax muscles and release tension) or choose from many indulgent treatments. Or just relax poolside or attend a seminar (such as how to improve your posture or what you should know about diamonds and gemstones). Atrium of Royal Caribbean International's Empress of the Seas. If you're as adventurous as your grandchildren, you can all tackle the rock-climbing wall, and if passive activity is more your style, grab some pool chaises and watch a 5:30 p.m. or 8 p.m. showing of the Big Screen Outdoor Movie. During our Empress of the Seas cruise, we watched "The Legend of Tarzan." On day 4, a day at sea, we watched "Star Trek Beyond" in the ship's Royal Theater. 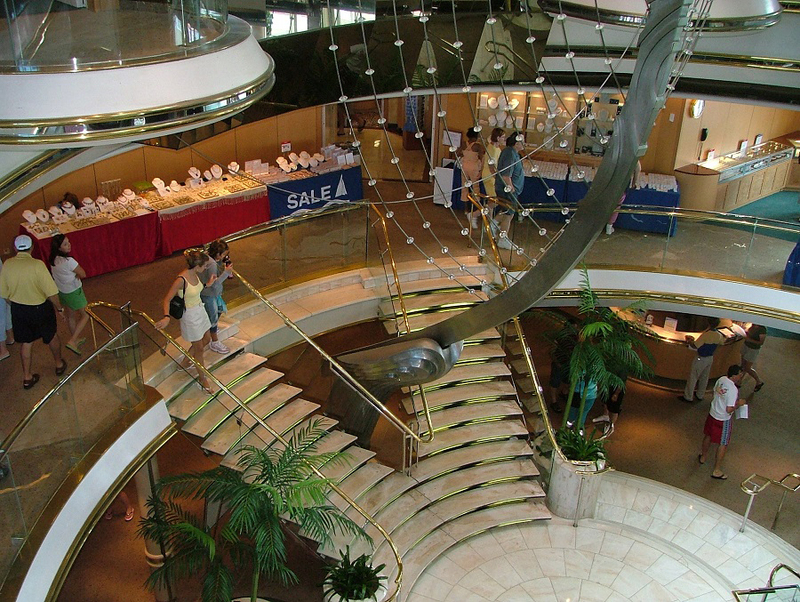 This theater offers nighttime entertainment starring the occasional comedian or singer, and shows performed by the talented onboard singers and dancers. The shows are appropriate for family audiences. Around the clock, meals and snacks are available, whether via the poolside Windjammer Cafe's buffet or in the Starlight Dining Room. Cruise guests can request "anytime dining" -- no appointed time for dinner - or they can choose an early or late seating. Empress of the Seas is a small ship, so the Windjammer was crowded during lunch hours, and it took several minutes before we found a table big enough to accommodate an entire family. There were thinner crowds during the serving of late afternoon snacks between 3:30 p.m. and 5 p.m. and at the Windjammer's Late Night Sandwich Bar (12:30 a.m. to 2 a.m.). The ship's bars are open until late at night. One of them, the Schooner Bar, is a favorite with many passengers who enjoy the nautical decor and the chance to sing-along. 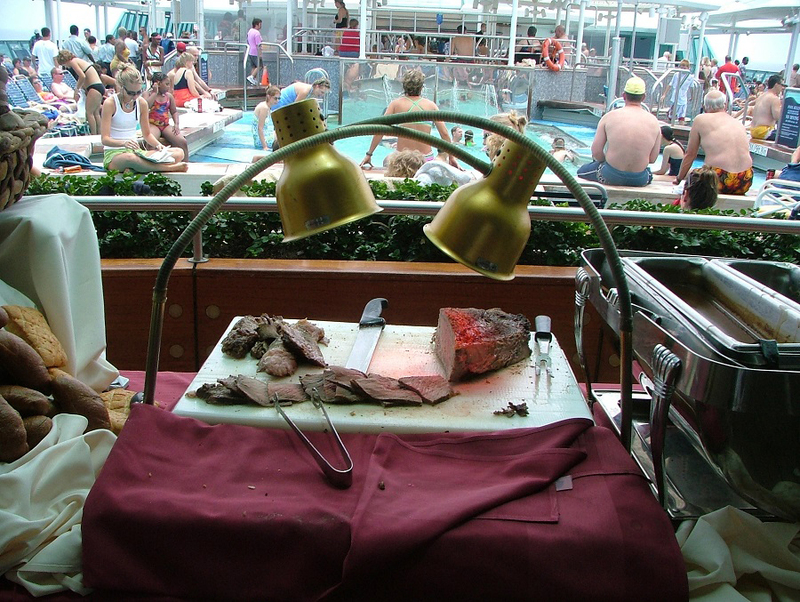 Empress of the Seas' specialty restaurant, Chops, touts its dry-aged steaks, onion soup and encrusted tuna. There is a charge to eat at Chops. The ship's jogging track and Vitality Fitness Centerwill help keep you in shape, but so will the poolside dancing under the stars parties, and dancing in Bolero's, the onboard swinging Latin-style night club. By the way, Gloria Estafan is the ship's Godmother. Like all cruise ships, there are shopping venues onboard, there is an internet center and there is even a library, although it made no sense to me that the library is completely open to the atrium, which makes it a sometimes noisy place to read a book. Our five-night cruise was round trip from Miami to Cozumel and Costa Maya, Mexico, which gives the multi-generational family plenty of time together and on their own, and an opportunity to explore the culture and colorful attractions of these Caribbean islands. Empress of the Seas is a good ship for families who want to introduce themselves to a cruise vacation. It offers just enough enticements. 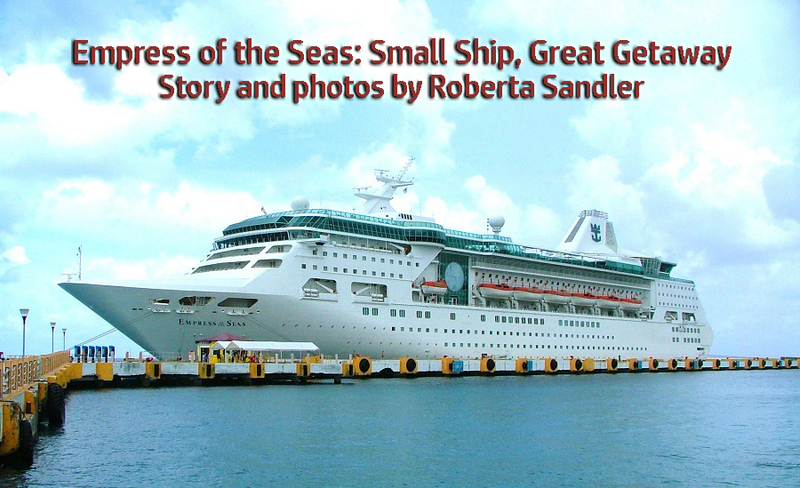 The ship becomes a stepping stone toward a follow-up cruise vacation on the big ships. And that's a whole other experience!